MANILA, Philippines - President Rodrigo Roa Duterte (PRRD)'s first State of the Nation Address (SONA) is happening today, July 25, 2016 at the Batasang Pambansa in Quezon City. Check out on this page the official full text and transcript of his speech in English and Tagalog (Filipino language). Duterte’s first SONA which lasted for 1 hour and 32 minutes touched on his campaign promises in fighting drugs, crime and corruption and in winning the peace in all fronts in the 25 days he has been in office. In addition, the president tackled wage hike for police and military, elimination of red tape, peace talks in Mindanao, federalism, abolition of contractualization, conditional cash transfer (CCT) program sustainability, hospital facilities for poor patients, livelihood and agriculture, improvement on Metro Manila transportation, creation of more jobs, resolution of West Philippine Sea dispute and establishment of OFW department. SONA 2016 was mainly delivered on English as the President is more comfortable speaking in this language. 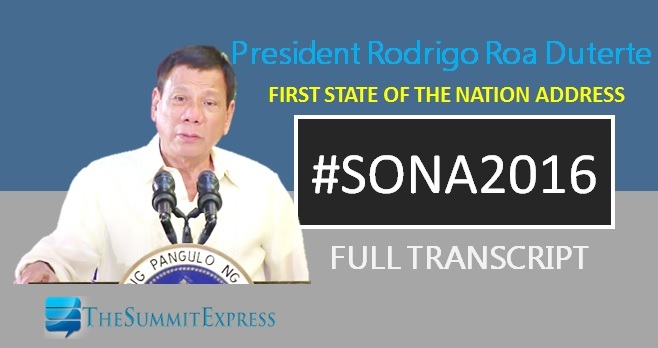 READ: SONA 2016 full transcript is available on this page. Kindly sit down. Thank you. Senate President Aquilino Pimentel III, members of the Senate, Speaker Pantaleon Alvarez and the members of the House of Representatives, Vice President Maria Leonor Robredo, President Fidel V. Ramos, President Joseph Estrada, President Arroyo, Chief Justice Maria Lourdes Sereno, and justices of Supreme Court, His Excellency Papal Nuncio and members of the diplomatic corps. We cannot... Well, of course, I have also to greet the Executive Secretary Salvador Medialdea, the members of the Cabinet, fellow workers in government, my countrymen. Except maybe extract a lesson or two from its errors we will not tarry because it is the present that we are concerned with and the future that we should be prepared for. Lest I be misunderstood, let me say clearly, that those who betrayed the people’s trust shall not go unpunished and they will have their day in Court. [applause] And if the evidence warrants, they will have their day of reckoning too. As a former prosecutor, I know there always --- ways of knowing how fast or how slow cases go. What I did was to look into the number of postponements and the time difference between each postponement and the next setting. It was simple as that. I will appreciate deeply if we all in government attend to this urgent need. I was determined then as I am now determined and better positioned, to wage war against those who make a mockery of our laws including those who make life for us all miserable. At this point, there are concerns few I wish to convey to all to the end that as I perorate on facts, figures, plans, programs, and solutions, these concerns will not dissipate or get lost along our way. To our police officers and other officials, do your job and you will have the unwavering support of the Office of the President. [applause] I will be with you all the way. Abuse your authority, and there will be a hell to pay, [applause] for you will have become worse than criminality itself. I order the National Police Commission (NAPOLCOM) to hasten the conduct of investigation and adjudication of administrative cases against police officers involved in criminal activities and illegal activities and prescribe policies on lifestyle checks for PNP members. The DILG is also directed to strictly monitor how LGUs perform their supervision functions of the police and those found not performing will be sanctioned including the loss of police deputation from the NAPOLCOM. Let me repeat my warning to all: Do not do drugs [applause] because you will be the solution to the drug crisis that has engulfed – malawak – the nation. There can never be real, tangible and felt development without making our people feel secure and it is our duty to uplift the people’s welfare. With this, my administration shall be sensitive to the State’s obligations to promote, and protect, fulfill the human rights of our citizens, especially the poor, the marginalized and the vulnerable and social justice will be pursued, even as the rule of law shall at all times prevail. Meantime, since our country continues to be confronted with internal security threats aggravated by the existence and activities of the terrorist group Abu Sayyaf, the full force of the AFP will be applied to crush these criminals who operate under the guise of religious fervor. The AFP shall enhance its capability to search and engage these rogue and lawless elements. We have to strengthen our coordination with Indonesia and Malaysia to suppress the kidnappings in the waters of our neighboring countries. We will strengthen our counter-terrorism programs by amending various laws on human terrorism, terrorism financing and cybercrime. This is our answer to the challenges of the global development’s non-traditional threats, transnational crimes and fanatical terrorism. Addressing global warming shall all will be our top priority, but upon a fair and equitable equation. [applause] It must not stymie our industrialization. We also endeavor to develop and corporate partnerships with nations sharing common interests and concerns with the Philippines; maintain and sustain bilateral and multilateral consultations and dialogues. We will continue to expand cooperation on human assistance, disaster response, maritime security and counter terrorism. We shall deepen security dialogues with other nations to build greater understanding and cooperation. On the aspect of our peace processes relating to our engagement with the international community, the Philippines shall remain committed to work under and with international partners achieving lasting peace and progress in the country. We will vigorously address the grievances that have been time and again expressed, not only by the Bangsamoro, indigenous peoples and other groups for security, development, fair access to decision-making and acceptance of identities. All of us want peace, not the peace of the dead, but the peace of the living. [applause] We express our willingness and readiness to go to the negotiating table, and yet we load our guns, fix our sights, pull the trigger. It is both ironic and tragic – and it is endless. While we extol the bravery and heroism of our soldiers — kayo the rebels – do the same for the members and fighters. What I see instead are the widows and the orphans. And I feel their pain and grief. And no amount of cash assistance or the number of medals can compensate the loss of a human life. [applause] Sorrow cuts across every stratum of society. It cuts deeply and the pain lasts forever. That is why, I reach out to you, to all of you today. To our Muslim brothers, let us end the centuries of mistrust and warfare. To the CPP/NPA/NDF, let us end these decades of ambuscades and skirmishes. We are going nowhere. And it is getting bloodier by the day. To immediately stop violence on the ground, restore peace in the communities and provide enabling environment conducive to the resumption of the peace talks, I am now announcing a unilateral ceasefire with the CPP/NPA/NDF effective immediately. [applause] And call on our Filipinos in the National Democratic Front and its forces to respond accordingly. Let me make this appeal to you: “If we cannot, as yet, love one another, then in God’s name, let us not hate each other too much,” so it was said. [applause] I say the same to you today. On the macroeconomic management, my administration will continue and maintain current macroeconomic policies, and even do better. We will achieve this through prudent fiscal and monetary policies that can help translate high growth into more and better job creation and poverty reduction. By the end of my term, I hope – I hope and pray – to hand over an economy that is much stronger, characterized by solid growth, low and stable inflation, dollar reserves, and robust fiscal position. On taxation, my administration will pursue tax reforms towards a simpler, and more equitable, and more efficient tax system that can foster investment and job creation. We will lower personal and corporate income tax rates [applause] and relax the bank secrecy laws. [applause] Eh na-Presidente ako eh. Ayaw ko sana makialam dito sa mga ‘to. Alam mo na. Well, anyway. May I continue. At the household level, there must be sufficient income for all Filipinos to meet the basic food and non-food needs for their families. We shall continue attract investments that will generate thousands of jobs each year – jobs that are suitable for the poor and less skilled members of the workforce. Reforms to ensure competitiveness and promote ease of doing business will be mandatory. [applause] Reacting to these needs, the restrictions on the economy will be needed to make more investments to come and to develop labor-intensive industries such as manufacturing, agriculture and tourism shall be pursued. The implementation of the Responsible Parenthood and Reproductive Health Law must be put into full force and effect [applause] so that couples, especially the poor, will have freedom of informed choice on the number and spacing of children they can adequately care and provide for, [applause] eventually making them more productive members of the labor force. We shall also enhance local business environment by addressing bottlenecks in business registration and processing, streamlining investment application process and integration the services of various government offices. Government Financing Institutions (GFIs) shall come up with out-of-the box financing packages to capacitate our small and medium entrepreneurs. Road development projects shall complement with our thrust to provide modern agriculture, infrastructural by expanding and improving the construction and rehabilitation of roads and the irrigation and establishing modern harvest and post-harvest facilities to minimize losses. On the other hand, we will accelerate infrastructure spending by improving national roads and bridges and implementing the Mindanao Logistics Infrastructure Network [applause] and other road network master plans. We shall pursue inter-island linkage projects. We shall be implementing structural mitigation measures to address of the perennial flooding in Metro Manila and neighboring areas. [applause] We shall put up new pumping stations in strategic places. Our anti-colorum campaign and out-of-line apprehension including the removal of terminals will be intensified and, my God, it will be done. [applause] Immediately, immediately. To address lack of road infrastructure in Metro Manila, usage of existing roads will be maximized. Thus, there is a need to cooperate and coordinate with LGUs to map out secondary routes and to consult various stakeholders, including the public transport operators. If that is the only worry that you have and I can understand your misgiving. Wala na ito sa... ang haba. [laughter] Wala na ito sa script. You know, ako maka-garantiya, 101 percent it will be clean. The problem is I can only act through agencies and departments. That’s why I urge you na maski konting mali lang, wala akong ano sa inyo, wala na akong politika, wala na. I’m through after this. I just pass on to you the information that, you know… I act through secretaries and... I cannot guarantee their honesty and competence at all times. Cabinet members, yes. Pero yung sa baba — yung procurement, yung magbi-bidding diyan. But as far as I can really --- malinis talaga ‘to. At napag-usapan namin sa likod about the federal system. Processing time in issuing permits and licenses shall be reduced to the barest minimum, in my city, it is always three days for local governments. That will bind the Office of the President down to the last barangay elect. Three days. Three days. [applause] Local government. Business permit, clearances, no follow-ups. Bigyan mo ng stub. Be back next week, tingnan mo yung work load and I will require every department, yung dito sa itaas. They must have a log book. Huwag sa computer. Kasi itong ganito na, nae-erase yan. Lagyan mo date, time, ‘I accept the documents of Rodrigo Duterte.’ Then you go to your computer. You must have an actuarial projections there. Look at the work load. Napaka-bobo mo naman. Tingnan mo, ‘Ilan ang workload ninyo?’ Pagkatapos, 'O bumalik ka dito, August 3, 3 o'clock.' Iyan 3 o'clock, ibigay mo, ibigay mo. Ngayon, I will be establishing 8888, only for, dedicated to corruption. [applause] Kapag may marinig ako sa Executive Department, even a whisper, even a whisper, hiwalay-hiwalay na tayo. Marami diyan, diyan sa gallery marami diyan walang trabaho, nag-aaply hanggang ngayon. [laughter] Hindi naman lahat kasi mayayaman yan eh. Mga asawa ninyo ata ‘yan. While the issuance and distribution of motor vehicle plates at point of sale, or through motor vehicle dealers shall be considered. Huwag na sa LTO kasi hanggang ngayon, panahon pa ni Hesukristo yung first plate nila, hanggang ngayon wala pa. [laughter] Bayad na yon. Until now, sa awa ng Diyos. May I address again to the Filipino: Ako po’y nagdo-doble ang pagod para sa inyo, para sa kapakanan ng bayan. Seryoso po ako. Kaya yung mga ganun, ticket-ticket at magkaroon ng gulo, huwag ho ninyong gawain yan. Ito na yung warning ko, yon na ang last, wala nang iba, hindi ko na gagawin: Huwag ninyong sirain yung mga bagay-bagay na ginagawa namin para sa kapakanan ng tao. Mabuti ang magka-intindihan tayo [applause]. Mamaya yung kayo --- kaibigan ko --- tangad, tangad, tangad [laughter] Kaya huwag na ninyong gawin. Simple lang ‘yan eh. Para walang away sa gobyerno, yung mga bagay na illegal at masama at hindi tama, huwag mong gawin, at hindi kami mag-aaway dito [applause]. Ulitin ko ha: He who is the cause of the cause is the cause of them all. Kami nagta-trabaho lang. We have a mission to God. We have millions of people to see that they are healthy. It’s a question of drug, it’s a question of public interest, public order. Kita mo, lesser crime. Wala na kasing magnanakaw, wala nang naghoholdap. Kasi para ---Bakit tapos sabi nila eh, 'maliliit lang ‘ yan'. Gamitin mo utak mo. If you are able to contaminate, kagaya ng negosyo ng mga Chinese, wholesale yan sila. Maski konti-konti kung the whole of Tondo contaminated, pera ‘yan. I am not saying it's the Chinese. Practice of nitong wholesale, retail. They go for wholesale. Maski na kumita lang ng isang piso diyan sa isang... Okay na yan. Kasi paramihan eh. Iyan ang ibig kong sabihin. Diretso ng Cavite, mulipad doon kay Tolentino. [laughter] 'O bakit may train dito sa Tagaytay?' It’s quite fast, quite fast. Sixty kilometers per hour and you are pulling something that’s heavy. When it really moves --- mawala ng ano--- it moves with a speed at a heavy thing at a great speed, ang hirap mong... Sumasadsad kasi mabigat eh and reduce headway time from 5 minutes to 3 minutes. Mahina lang tayo...Ang plano ni Tugade, mahina lang tayo ng one minute sa Hong Kong. Two minutes, sa kanila three minutes eh. Art, ambisyoso ka ah. Kaya mo kaya ito? Specifically for the LRT, the operating hours shall be extended from 9:30 to 10:30 p.m., so marami pang mga bata ang uuwi niyan. [applause] And to absorb more passengers, delays in the procurement of additional trains shall be addressed soonest. Now, iyan ang sinasabi ko, if you want the long way, fine. Wala akong problema. Sabihin ninyo na doon ang --- we go the normal way if we are able to make purchases. Eh ang maganda nito, I have signed the Executive Order sa aming FOI. Naunahan ko kayo. Iyong inyo... Nandoon na ang sa akin [applause]. Oo, tapos na ako. Ilabas ko na --- it will be out today. Alam mo sabi ko, unahan na natin itong Congress, puro mayayabang ang mga nandiyan. We grab the --- each other...They say, "stealing one’s thunder," ika nga. Unahan na natin. Sabihin naman ni Senator Drilon, 'Binack-bite ka dito. Lalagyan daw nung ano, yung island mo ng train. May tawa pa.' Binaback-bite ka dito. Mag-sumbong man 'yan. Tingnan mo 'yan. I have to protect the country. Many are complaining against the appointment of Gina Lopez. But si Gina pati ako, we share the same paradigm: The interest of the country must come first. But hindi ko naman sinasabi, there’s a law allowing mining. Gina Lopez and I are just telling you: Follow government standards. Do not destroy the environment. Follow it to a tee. [applause] Wala tayong problema. Just pay the correct taxes, follow the standards. Gina is just doing her job. You know, she’s a really a crusader, that is how I describe her persona: Crusader. Sabi ko tama yan. Bakit? Nandiyan ba si Ma’am? Si Gina Lopez? Secretary Lopez, nandiyan? To have adequate disposal facilities for the Metro Manila Garbage, the final closure and rehabilitation of the Carmona Sanitary Landfill shall be pursued while the adoption of appropriate waste-to-energy facilities will be explored. Marami yan. The technology is coming very fast. To better manage public information, a law should be passed – I’m addressing Congress-- to create the People’s Broadcasting Corporation, replacing PTV-4, [applause] the government-run TV station, which now aims to replicate international government broadcasting networks. Teams from these international news agencies --- I’d like to mention those interested BBC --- are set to visit the country soon to train people from government-run channels to observe. Ito ang gusto ko --- tutal pera naman ng tao --- to observe editorial independence through innovative programs [applause] and intelligent treatment and analysis of news reports, as well as developments of national and international significance. The government’s Bureau of Broadcast Services, better known as the Radyo ng Bayan, shall undergo upgrading to make it financially viable and dependable for accurate and independent, and enlightening news and commentary. Radyo ng Bayan will be integrated with the PBC. The PCO shall coordinate with the Office of the Executive Secretary and the Presidential Legal Counsel in implementing the recently approved EO on the Freedom of Information. There is an Executive Order, it's out. As an example on the part of the Executive Branch to make transparency and integrity as yardsticks in government performance, savings and expenses while engaging the public to be vigilant in participating in government programs and projects. The PCO, in coordination with the Office of the Executive Secretary, is drafting the Administrative Order on the Task Force on media killings. This government does not condone violence and repression of media. [applause] The bona fide media... Bona fide media...Sometimes they pronounce it "bonafid". But whatever that thing is, the bona fide media has always been our partner for change. [applause] Medyo klaro yan. Anong gawin mo sa hindi bona fide media? Iyan ang problema. To address backlogs and low prosecutorial effectiveness and efficiency, the investigation and case management processes shall be streamlined including those for illegal drugs and heinous crimes. Punta muna ako dito ha, itong federalism. Ewan ko kung tama. Alam mo, itong bayan natin, if I may just repeat. I know that you know — on 1521, Magellan landed in Leyte. [laughter] Kumare ko man ito. [Salamat, mare ha.] [laughter] Mindanao was already Islam by 100 years. So, ano ito, it’s an imperialism thing. There’s a historical injustice committed against the Moro people. We have to correct it. But it is well possible now. Kaya kayong mga kapatid kong mga Moro, alam naman ninyo. Ako, I’m mixed. Migrant ang tatay ko doon. So, mixed-blood ako. Moro pati Christian. But, you know, intindihin na lang natin ito, that we can return to you all. Iyong nakuha ng mga Amerikano, Español, pati yung mga Pilipino, mga kapitalista, those who exploited Mindanao with that thing sloganeering go to Mindanao because it is a land of promise. With the vast entry of so many people, basically coming from the Visayas, magkaroon tayo ng… We cannot solve it the way you want it to be. We have to understand each other then you have to live with each other, but we will try. Ang sinasabi kong babalik ako, dahil ako sa federalism. Both Misuari, Sema and all, at least the politiko leaders ng Mindanao will agree to it. We do not...Remember that ako ‘yung… Hindi ko dinidikdik yung masyadong Abu Sayyaf because it is really connected with the first talks between Misuari, the President, subsequently President Marcos and now, until now, until now. The only way they said that we can have this. Iyong BBL, ibigay na natin, minus the things that you do not want. [applause] Iyong mga Constitutional issues. Tanggalin muna natin. Ibigay ko yung area. Nandiyan na yan eh. So I ask you pass it minus the Constitutional issues that are contentious. [applause] Ibigay na natin at when the federal system comes, isali mo na sa package, together with Misuari. That is the solution for Mindanao. Nothing else. Believe me. Nothing else will do. Please sleep on it, ponder on it, because that’s the only way to proceed. On the clamor of our citizens for timely issuance of Philippine passports, the government shall work towards amendment of the 1996 Passport Law to lengthen the validity of the passports from the current 5 years to 10 years. [applause] Tutal kayo naman ang maggagawa ng batas. You are the ones who will pass the law, even if you make it good for 30 years, okay ako. Bahala kayo. [laughter] Basta, stretch a little bit because five years is just really simply on a regular basis. Matagal pa naman itong passport. Mag-apply ako, ten days. Alam mo, I’d like to call the attention of Secretary Yasay. If you go to Davao, look back doon sa… Look at the back, likod ng nitong mall, yung malaking mall doon. O sige, pangalanan na natin, SM. Doon, yung mga tao nandiyan sa pavement natutulog. For the many times nadaan ako na walang ulan, doon lang sila because first come, first served. And the only outlet there --- the outlet of your department is yung sa SM. So yung mga, maawa ako. Dito sa side sa Cotabato, lahat ng Cotabato, doon sa Davao. Karamihan yan, walang mga bahay. If you’re an applicant in Davao City, fine. But you know, kung walang, mahirap kasi. Karamihan diyan, mga Moro. Naghihiga lang diyan sa pavement. Nasasaktan talaga ako. Masakit eh. Buong gabi mo hintayin hanggang mag-bukas yang SM kasi first come, first served. Alam mo, nandiyan naman yan. Sabi ko what I want is a journal. When the applicant presents the documents, give them a shopping list. Do not add or get anything away from it. Iyon lang yon, final. And when he complies with that, that is good. Huwag mo na siyang pabalikin. [applause] Kasi kung mag-tawag yan ng 8888, my God, puntahan ko talaga kayo. Iyan ang bisyo ko noong mayor ako. It will not make a difference mayor o presidente. Puntahan talaga kita, hiyain kita sa maraming tao. And I would publicly ask you: “What the hell happened to the procedure?” Pupuntahan ko talaga kayo. Local, barangay, pulis, military, lahat. Bigyan mo ng shopping list, huwag mo ng pabalikin. Because pag mag-tawag ng 8888 yan, tapos makita ko na the grievance is valid, bahala ka. Anong walang panahon? Pupuntahan kita sa opisina mo. [inaudible] Bakit? Bigyan mo ng stub. You have to employ actuarial ability, that’s easy. Para pag-tanggap ng tao — I’m addressing myself, under me — journal. Papirmahin mo siya. Lagyan mo doon, tingnan mo sa computer. Mag-connect ka doon sa actuarial. Hindi mo kailangan ng bobo diyan e. Matatapos siguro yan mga next month tapusin ko. Projections lang naman. 'O, balik ka dito August 15, 3 o’clock.' Pagdating, ibigyan yan. I have the reason why I do not go out. I do not accept invitations. Hindi ako tumatanggap because every time I travelled around Manila, it causes a huge congestion. Kasi pag itong pag-uwi ko, [inaudible] by projection. Paglabas ni presidente, ano yan, picture taking ganon. And they start to block the--- yung roads access to the...Ganon iyan. Everytime a president come out, ganon iyan. So, paparahin nila iyan, sasabihin nila, dadaan iyan by this time. And in the meantime, sarado yan. Paglabas ko, akala mo Biyernes Santo. Walang sasakyan diyan. I have also ordered the DFA to streamline documentary requirements and passport applications and open additional Consular Offices in strategic places to decongest Metro Manila sites [applause] and avoid queues that have caused hardships and suffering to passport applicants. Wi-Fi access shall be provided at no charge in selected public places [applause] including parks, plazas, public libraries, schools, government hospitals, train stations, airports and seaports. O ‘di ba? [applause] Happy lahat. To help ensure that the hard-earned money of the Filipinos overseas are put into productive use, a mandatory financial education for all migrants and their communities will be pursued with incentives to encourage entrepreneurship among them. I may now also ask on Congress to consider drawing up bills consolidating and merging agencies and offices having to do the Overseas Filipino to have a department that shall focus on and quickly respond to their problems and concerns. Kailangan ko ng isa. [applause] And I have asked… I don’t know if Secretary Bello is here, Bebot. Wala? Absinero talaga yan. [laughter] Maski sa Cabinet absinero yan. Gusto ko, he will rent or we’ll lease some buildings here for overseas only. At lagyan ko ng – and they will direct all BIR, lahat na. BIR, lahat ng something to do with the clearances of the police, in one building, may booth lang. I said: My God! Make use of the computer. So doon lang siya mag-ikot sa isang building. Ang Pilipino, hindi na siya mag-punta doon sa Statistics. Hindi na siya punta doon sa ano, diyan, diyan sa opisina. Gamitin ninyo ang computer and you can get the results right after. Why do we have... Has to travel to Malate, then he will just stuck in the traffic. He can only accomplish one document at one time. Ito: To help avoid squatter-like conditions in relocation sites, we urge utilities like Meralco and electric cooperatives to exercise their social corporate responsibility by making direct connections to relocation sites and depressed areas. Alam mo kung bakit? Kaya nga nilagyan nila diyan e. That’s why I had to talk to you ganito. 'Bakit?' It’s because walang kuryente pagka mahirap ka. You do not own the land. That is my experience 23 years as mayor. Hindi magbigay ng direct connection. Kasi hindi ikaw ang may-ari ng lupa but that squatter, they have been there for 20 years. So mag-connect-connect sila. Pag ka-connect-connect nila, ang gamitin nila yung wire na, yung pinaka-mura. So it overheats because connect-connect na lang sila kung sino yung minsan magnakaw. You know, we will have to make the adjustments. It is not for these people to make the corrections because they are not in a position to do it. We have to adjust to the needs of our people. Total diyan naman yang sa squatter na yan, as long as I sit here as President, there will be there no demolitions without relocations. Hindi talaga ako papayag. [applause] Hindi naman aso yan na --- just like in Davao. I’d like to make a dialogue with the businessmen. “Sir, how much are you investing in this land you have bought with the squatter?” "So, I bought it at about 60 million." Dagdagan mo ng 20 million. Ako na ang bahala. Sabihin ko doon sa mga tao, "Bili tayo ng relocation site or I will provide." Government will expropriate. I will make use of the expropriation powers. Ako ganon sa Davao eh. I have 20 hectares there. I will expropriate some land there. Iyong malapit lang. Then sabihin ko: "This 20 million will help your journey to a new land." And I will urge everybody na yung mga bagong mga factories, doon sila mag-tayo. I have directed the concerned regulatory agencies to prioritize the issuance of required permits for power development. Okay ‘yan sa akin. Ang problema sandali ito. [Para ka diyan.] Iyong mga environmentalist, meron tayong, meron tayong, ano kasi – marami ang coal. Pati yang... Ito nga, itong energy emissions, wala man akong problema diyan. But do not tell me na, if you... Ambassador ka tapos sabihin mo sa akin na, 'medyo hanggang diyan lang kayo, kasi kami hangang dito lang kami. ' Sabi ko, 'Ano? Kayo umabot diyan. You are now in the apex of your industrial might. But along the way, you were the first – America, China, Europe.' Kayong bomba-bomba, until now we contribute only something point zero. So, if you put so much restrictions doon sa treaty na yan, the treaty which we are trying to – it's still here in the Senate. Let us be very clear on this: We need to industrialize. We need the power and, therefore, the emissions would also be considered. You just can't say it: 'I established five economic zones here'. And you start to say that, 'you are spewing so much carbon footprints'. Mahirap yan. I mean, it's hard. I cannot just agree on anything that will delay. I’m only good for six years. To strengthen the delivery of social services, the government will intensify its protection programs, so it can use its resources, expertise to make a dent in the country’s poverty levels. What we want is genuinely to reduce the vulnerabilities of our people, build resiliency and empower individuals, and families and communities. The beneficiaries of 4Ps shall be made to become independent and self-reliant after they have graduated from the program [applause]. But the aim is to present it with other forms of assistance, so that they can stand on their own two feet. We are planning to increase spending on basic education and incorporate mandatory education about the evils of drugs. We will also intensify and expand Alternative Learning System programs. The government will also provide universal health insurance for all Filipinos [applause]. Benefits – Sali na lang natin sa PhilHealth. The professional competence and operational capabilities of government hospitals and health facilities will be strengthened. Consistent with our international obligations, in keeping with national mandates, this administration vows to protect women’s rights and human rights abuses [applause] against our women, because this unacceptable to... Kung mag-bugbog ka ng babae. Thus, I order all agencies and oversight bodies and local government units down to the barangay level to fully implement the Magna Carta for Women. [applause] By doing so, we'll ensure that man and woman will be partners in the pursuit of country’s economic, social, and cultural and political developments. To our Lumad brothers, and they are here outside. Outside? They are here outside I’m sure . I told the... Just to let them come if they want. Kanila man ito. To our brothers, I have this to say: The government has issued you the Ancestral Certificates Domain Title covering vast tracts of land especially in the Island of Mindanao. You have the Indigenous Peoples’ Rights Act, and the National Commission on Indigenous Peoples to protect you and to assist you. Government has given you the tool, the legal tool to improve yourself financially, economically and socially. Make use of your ancestral domain. Do not let it remain idle. While the government is always ready to help you, you must first help yourself. We cannot legislate financial and economic progress for you. It is you and you alone who can do that. You can chart your fate, but do it within constitutional and legal means. After being devastated by natural and man-made calamities these past few years, we are still to recover emotionally from the loss of our loved ones, and materially from the loss of our homes and our income sources. There are many among us whose emotional wounds are still fresh and painful to the touch. We cannot erase the images of death and destruction from our minds. We cannot wash away the stench of rotting flesh from our noses. And there are many of us who are still waiting for the help that was promised. The enormity of the problem of drug addiction has been made manifest by the number of surrenderees which grows by the hundred each day that passes. Since July 1, we have already made 3,600 related drug arrests. 120, drug dependents have already surrendered and 70,000 of them are pushers. You think this is just a... [applause] It could take the entire resources of this government to fight this war. I have nothing but the interest of my country. But let’s wait because the PDEA says that – it's about the past statement made by the Philippine Drug Enforcement Agency. Two years ago, PDEA came out with a statement that there are 3 million drug addicts in this country. That was two or three years ago. How do you think – would the number incrementally if we count now? Give it a liberal addition. Maybe, gawin mo na [700,000]. So three million seven hundred thousand [3.7 million]. The number is quite staggering and scary. The drug lords that you desperately want to strangle are not here. Wala mga bilyonaryo dito. The ones that you catched, running after, are just the lieutenants. They do it with technology. They’re cooking it in the international waters. Itinatapon nila 'yan bulto, by the drums. Dikitan nila ng GPS. So makikita agad. We are hard put sa intelligence because they have invented this direct satellite. Hindi na magdadaan yan ng...All they have to do is to triangulate where the – pag-ikot niya. And there's so many – and they are in codes. If we do not help from our friends here in Asia and America, and Europe – this year number and problem, believe me, will drown us as a Republic. Kayo tingnan ninyo ito. How can I solve the problem now by arresting? Hinahanap... Kung matagal na akong Presidente, gusto kong patayin. Ang problema pupunta pa ako doon and I'll ask the permission from this country that I will go because I have to slaughter these idiots who are destroying my country. Ganoon yun eh. [inaudible] Presidente, ayaw ko naman bitawan, kasi ayaw naman kasi ng military, pati pulis. But you know, I said, "I’ll be talking in front of the Republic to its representatives, for the people". So I have to tell you: "How do we solve this problem?" Can we? Ako naman okay lang eh. Make it public, fine. Make it confidential, if you go to me or go to you, to your house, okay. But that is really the enormity of the problem. It's so enormous that you are intimidated even just to make a move. Because you cannot stop it anyway. Mabunggo mo isa dito hinulog sa dagat, eh marami naman nagluluto doon. It’s a free for all enterprise for the criminals at this time. Kung ako, if I had just the plan...Sabi ko, sabi ko sa military kapag nakita ninyo, pasabugin mo na. Maski nag-surrender yan, may white, white flag. Pang-giyera lang yan, hindi yan pang-kriminal, pasabugin mo. Show no mercy to them because they're not doing any mercy to us anyway. Bakit ako...Iyan ang problema. But we should not despair. Like someone wrote: It is when the night is darkest, that dawn breaks. We are imbued with resiliency that has been tested and proven. More difficult times As in the past. We have a bond to act together. We have to help each other. For then and only then can we truly prevail. And the Filipino, disciplined, informed, involved, shall rise from the rubbles of sorrow and pain. So that all the mirrors in the world will reflect the face of a passion that has changed this land. What do you think of President Duterte's SONA 2016? Tell us in the comment section below.